Ridgway perform on Saturday, July 2, at HopMonk, 224 Vintage Way, Novato. 7pm. $10; free CD with every ticket purchase. 415.892.6200. THE RIDGWAY WAY way While their heads are in school books, the band’s heart is in making music. 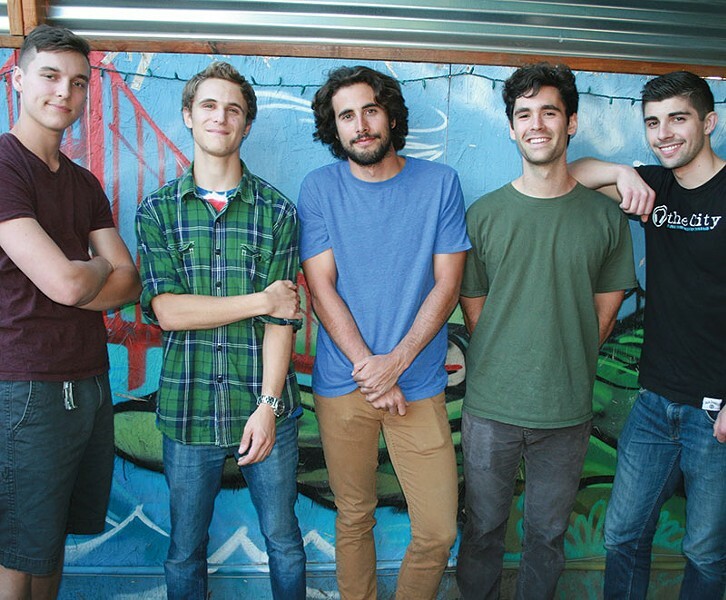 Formed three years ago in Novato, Ridgway have made their mark with a groove-based blend of reggae, rock and hip-hop that's a popular staple not only in their hometown, but also at fairs, festivals and venues throughout the Bay Area. Brighter Days, with a show at HopMonk in Novato on July 2. "Music was always around my house," says Jordan Kulp, founding member and lead guitarist for Ridgway. His father is San Francisco radio personality Jack Kulp, and Jordan grew up listening to Motown, classic rock and reggae albums. He got his first guitar in fifth grade and immediately took to it. Kulp met fellow guitarist Jack Buzian in middle school, and the two started jamming in the garage, at first playing a decidedly metal mix of songs inspired by the guitar-driven rock and punk of the '90s. Yet the reggae that Kulp grew up around stuck with him. "I had that childhood sentimental connection to it," he says. By high school, Buzian and Kulp were playing a laidback sound more akin to Sublime than Slayer. Still, Kulp says Ridgway wasn't really born until friend and vocalist Forrest Bousquette joined them and added lyrics to the music. Bousquette coined the name Ridgway from the Santa Rosa neighborhood he grew up in. In fact, the band was originally called Ridgway Space Station, though they shortened the moniker soon after. They also recruited drummer Keelan Scarth and bassist Erik Trignani to fill out the rhythm section and released their first EP, The Extra Mile, in 2014. For the last year, the band has been busy in the studio recording Brighter Days at NB Recording in Fulton, a small studio run by engineer Nick Botelho. The new album incorporates a lot of Kulp and Buzian's riff-based metal from the early days laid over a reggae beat, though the music is appropriately sunny and positive. Kulp now attends the Berklee College of Music in Boston, studying music business and record production. Other members of Ridgway are also balancing work and classes at Santa Rosa Junior College while remaining involved in music. "Balancing school is tough," says Kulp. "We are trying to put our education first, but Ridgway is something we want to put as much time into as we can and eventually make a career of it."